Teachers in Higher Education usually join the teaching profession without any formal training in teaching methodology, learning psychology and classroom management. They develop teaching skills out of their own experiences or from experiences shared by colleagues in course of their teaching career. This non-formal and incoherent acquisition of knowledge of teaching-learning paradigms, the mastery on teaching methodology among the faculty suffers from inadequacy. Moreover, the traditional methods of lecturing do not meet the demands of the dissemination of knowledge in classrooms effectively in today’s scenario where outcome-based education and student-centered teaching are the order of the day. 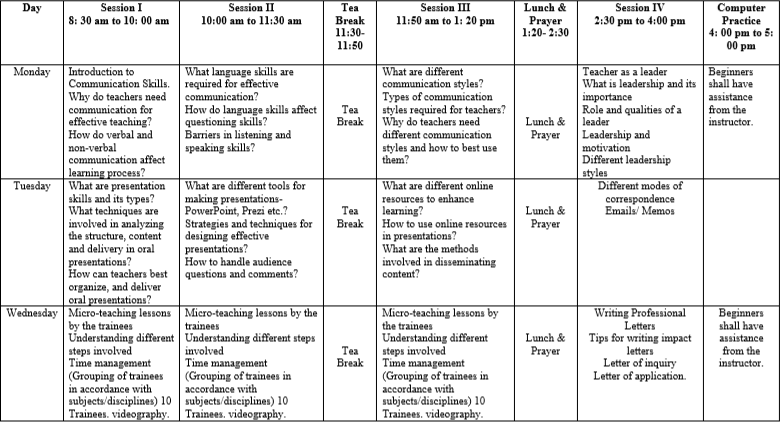 A good teacher training program should be like a support for teachers to sharpen their teaching techniques as and when required. It is important for the teacher training programs to understand the need of the teachers and take due cognizance of the teachers as adult learners. The Government of Punjab has entrusted the responsibility of training the newly inducted faculty of public sector colleges to Punjab Higher Education Commission (PHEC). PHEC is fully aware of the training needs of newly inducted teachers to beget an enabling learning environment in our colleges. In the first phase of training, PHEC is organizing the training program for 678 newly recruited Lecturers of the Higher Education Department in its purpose-built and state-of-art residential Faculty Training Academy. The first phase will comprise on 07 batches, training around 100 teachers in each batch. Train the participants in modern teaching methods and strategies. Prepare the faculty to understand their roles and responsibilities in Higher Education and to impart essential professional skills, competencies and attitudes. Shape the participants know the structure, functioning, governance in Colleges and to orientate them to become potential partners in institute building. Upskill the participants in methods of evaluation and assessment of diversified groups of students. Capacitate the trainees become confident presenters in the classroom as teachers by improving their communication and presentation skills. Deliver round the clock conducive learning environment by promoting social interaction opportunities to learn and make others learn. Provide chance to trainees take care of their health through sports activities. Provide opportunities to engage and network with their colleagues through different sports activities and competition. Highly qualified and skilled teacher-trainers in the field. Use of modern delivery methods and outcomes-based sessions. Special focus on presentation and communication skills using latest IT equipment. Learning to use latest IT equipment and online tools effectively for classroom education. Intellectual interaction, social and academic discussion 24/7. Engaging and networking opportunities with colleagues and resource persons. Regular computer practice hours to learn and improve computer skills. 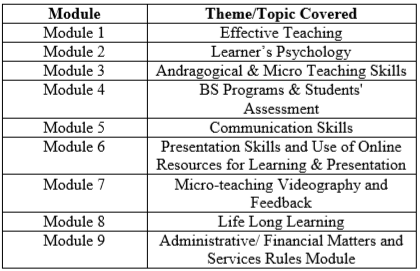 Life-long learning as a cross-cutting theme and also dedicated sessions on the subject. 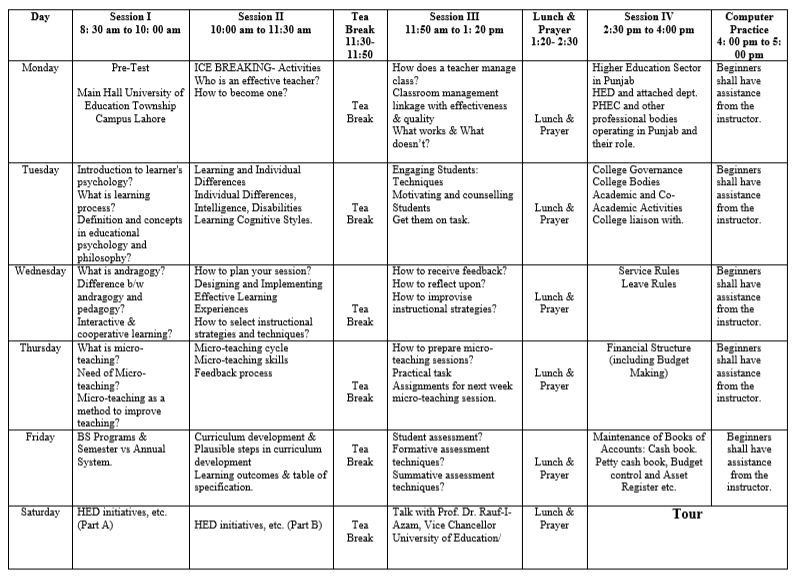 Additional sessions on rules and regulations, finance and budget apart from academics. Guest lectures from senior academics, renowned professionals, motivational speakers and Vice Chancellors of public sector universities. Exposure visits, and cultural evening to promote peace and harmony. The induction training program is strictly nomination based. The HED nominates the newly inducted faculty for training at PHEC Faculty Development Academy.